Laura Hoffman Illustration & Design: Artwork at the OC Fair! For years, I have been encouraging - and even insisting - that my students should enter their best work in the Orange County Fair. After going to the OC Fair this year, I am thrilled to find over 60 of my students' work is hanging in the photography area in the Visual Arts building. Many have earned medals. 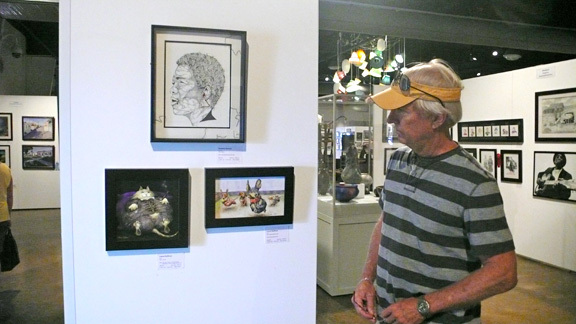 So then, I decided to submit some of my artwork to this juried exhibition. The cool thing is that millions of people file through the exhibits and see the work. It's not easy to get in. Only about 1 in 5 photography submissions make it past the jurors, while 2 in 5 fine art submissions make it in. It's a trip to hang out and overhear what people say while passing by the artwork. This happened accidentally; I happened to be grabbing for my camera and watched people react. Some folks took pictures with little smart phones, and most smiled and laughed - which made my day. One guy said, Oh, I love wienies!! I'd totally buy this if it wasn't $600.00!" Ted looking at the art. After spending hours at the Visual Arts galleries - there is so much to see - we headed over to my next favorite fair hang-out (besides the wine bar - recommend! ), the livestock area. 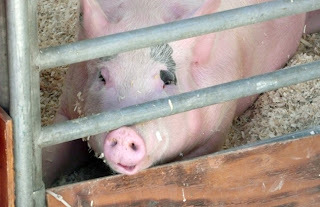 Living in Orange County, you rarely get a chance to get up close and personal to beasties, unless you get to the fairs. 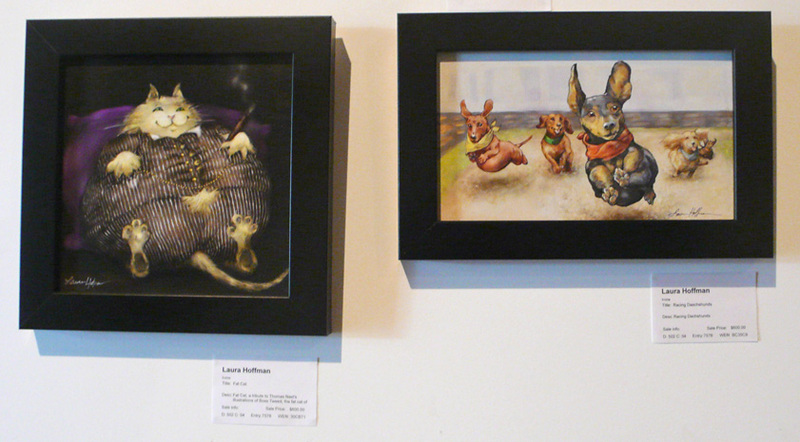 I love animals, drawing and painting animals, telling stories about animals, and photographing animals. So this was one of the things that bothered me at the OC Fair - they had these guys right next to the bacon stands. Even chocolate-covered bacon. I won't tell them. 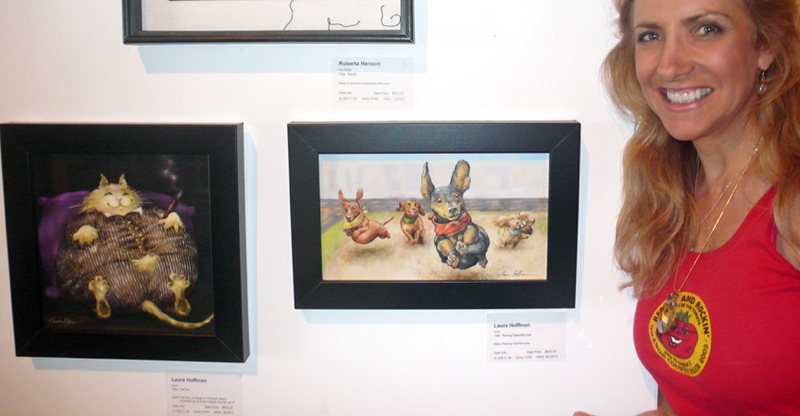 Get to the OC Fair, if only to see the artwork. OK, the food is amazing also and most of it is sinfully fattening - but you'll wear it off. The rides are a blast also. So are the concerts - and don't miss the wine bar, seriously. 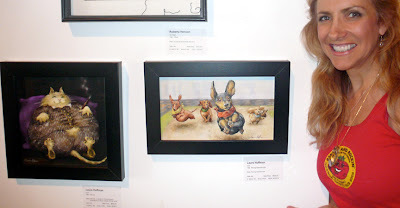 Nice job on the blog and congratulations on your OC Fair entries! Chocolate covered bacon??? Good grief. I know, it's gross but you can find that at the OC fair.